Starting early we fish top water for the first few hours. As the sun climbs and the day warms you will find the smallmouth moving to the cool riffles and pools. During this time you can fish a variety of nymphs and streamers. About midday you should probe the riffles and pools with streamers and nymphs. As evening approaches the smallmouth will start feeding on the surface, where you can use a variety of dry flies and poppers. Never underestimate the smallmouth. They can be crafty and difficult, and, when they want, can tax your patience. 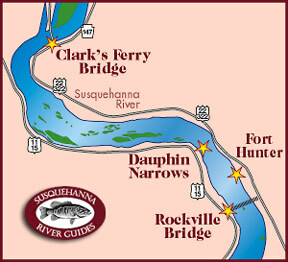 The Susquehanna is rich in food for the smallmouth, with the rocks and wide shallow riffles laden with nymphs, crayfish, and other foods. The shallow water and gravel bottom ensure prolific hatches and rapid growth rates for both forage and gamefish. 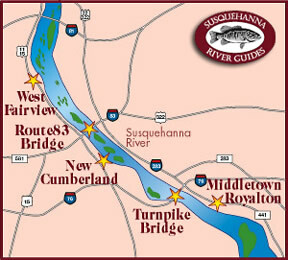 A full day guided trip for two fisherman starts on a 7 to 9 mile stretch of river basin, personally selected based upon current water levels, conditions and the season. Beginners and advanced fishermen are welcome! 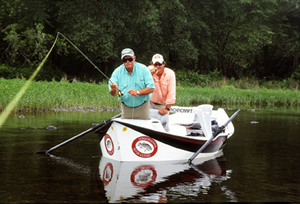 If you’re just starting out, all tackle — including rods, reels, lines, and flies are provided at no charge. 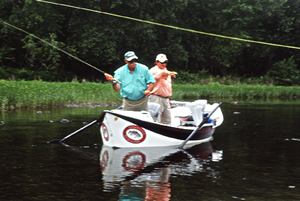 Casting instruction and fly fishing tips are part of the day to help you hone your skills. Lunch and drinks make for a nice break in the day…and offer time to swap old fishing tales. 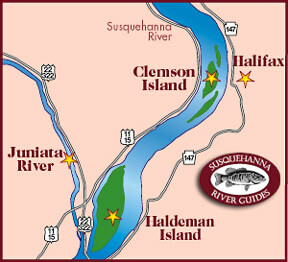 Float the beautiful Susquehanna or Juniatia Rivers with Susquehanna River Guides! Our experience and in-depth knowledge of the river, its inhabitants, and the environment is your assurance of an enjoyable and successful day! Shallow water laced with boulders and ledges that run across the river. Expansive broken rock with cobblestone flats, along with small islands of duckgrass, provide excellent habitat for big smallmouth. Shallow sections boast both large and small islands, creating edges and back eddies. Grass beds are strewn among numerous gravel bars. Deep ledge systems in and around the Dauphin Narrows. This is big water smallmouth bass fishing. Big slow water, with numerous submerged ledge systems and expansive gravel flats. 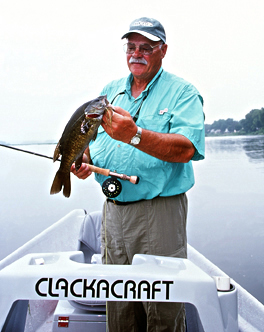 The rivers’ mix of many speeds and depths provide the perfect habitat for smallmouth bass. Click here for more information on our Guided Trips and Package Trips!